Jari WERC Alvarez, Donkey Show, 2008, mixed media, 12 x 24 in. Collection of Cheech Marin. © Jari WERC Álvarez 2013. Meeting Cheech Marin would lead most people to reference one of the dozens of TV shows or films in which the actor has appeared. Escondido native and San Pasqual High School graduate, Michael Flores took a different approach. He talked about art. One of the classes Flores took when he attended Cal State San Marcos required a trip to an area museum. He visited one in La Jolla that was exhibiting works from Marin’s extensive Chicano art collection. Years later, it provided the perfect ice-breaker when he met Marin. It’s not unusual for Flores to rub shoulders with Hollywood notables. A certified public accountant, he has spent most of his post-graduate career working in accounting and finance for entertainment companies in the Los Angeles area. Today, he is an accounting manager for WGN America, a TV channel owned by Tribune Media. “I never in a thousand years would’ve thought I’d be doing what I’m doing,” Flores said. That unexpected path began at CSUSM. Flores’ connection to CSUSM goes back to the days of the Prohoroff Poultry Farm, the chicken ranch that operated for decades where the University now stands. Tina Flores, Michael’s mother, lived on the farm for about nine years in the 1960s before moving to Escondido where she still lives today. Tina Flores said Grand Avenue in Escondido was a gathering place for people in surrounding communities such as San Marcos, Ramona and Valley Center. They would visit downtown Escondido to shop at stores like J.C. Penney and Sears and pick up groceries at Rube Nelson’s market. “Grand Avenue was where everybody knew everybody,” she said. Michael Flores is too young to have memories of the farm. He grew up in Escondido and was an accomplished student and baseball player at San Pasqual High School. He considered attending San Diego State and trying to continue his baseball career under the tutelage of the late Tony Gwynn, but he also wanted to pursue an accounting degree. With SDSU’s business program impacted and CSUSM offering an impressive student-to-faculty ratio, Flores chose to stay closer to home. Flores did have one more opportunity to give college baseball a try as CSUSM’s fledgling program played its first season during his senior year. But by then he was on a firm career trajectory — he had a position waiting for him at PricewaterhouseCoopers and didn’t want anything to distract him. Flores credits CSUSM’s Accounting Society for having a tremendous impact on his career. He said networking opportunities were invaluable and he also was able to learn about everything from workplace professionalism to dinner etiquette. “The networking opportunities they provided created a whole path for me,” he said. Flores, who lives in Santa Monica, said he wouldn’t mind someday moving back to North County to be closer to family and friends. But he also loves working in the entertainment industry, which means staying in the Los Angeles area for now. His work includes dealing with budgets and funding, usually for at least four to five projects at a time. The number of concurrent projects can easily eclipse double digits during busy times. “There’s constant accounting that needs to be done,” he said. 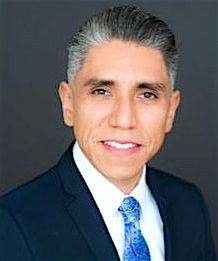 Flores would eventually like to become the chief financial officer of a studio or a vice president of production finance, and he also wouldn’t mind someday returning to CSUSM as an accounting professor. Be the first to comment on "San Pasqual High, CSUSM alumnus thrives in entertainment industry"